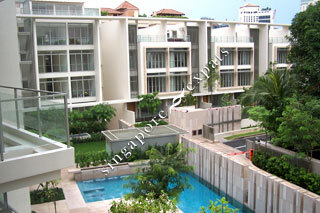 Tanglin Residences is located in the prestigious tree-lined Saint Martin's Drive. Orchard Road and Tanglin Road are at your doorstep, along which the best shopping and dining facilities are located. A specialty supermarket, boutiques and chic department stores, fine restaurants and bistros, hotels and town clubs are all conveniently close by. Feel like a job or a respite in the park? The Botanic Gardens is just around the corner. Space and light within the units create mood and elation as well as providing a setting for joyful living and places for your favourite furniture pieces. Space is a concept that opens up new opportunities and adds a new facet to living. Enjoy it, explore it at Tanglin Residences. A premium collection of only 10 townhouses and 33 apartments along a tree-lined cul-de-sac. The architecture is strikingly modern and functional yet companionable and intimate. Perfect freehold homes for those who long for sanctuary and privacy. Suitable for expats and those who wants to experience upmarket city-living near Orchard Road!